Caves Bocairent The Moorish caves of the small mountain village of Bocairent situated in the Valencian community of Spain. Bocairent – The Incredible Moorish Caves (Les Covetes dels moros – Spain) Caves Bocairent. The Moorish caves of the small mountain village of Bocairent situated in the Valencian community of Spain is just one of the many fascinating places to visit in and around the village. The Moorish caves consist of around 50 manmade caves that date back to medieval times set into a rock face some 300 meters from the village. The caves are all interlinked inside though a series of openings in the rock and you are allowed to explore them freely. What you can see the photo above is a group of cave-windows, or man-made caves with holes in the shape of windows, which were carved into the side of a rock escarpment. Situated on the right hand side of Fos Ravine they are only 300 metres from the town’s old quarter. This is the most complex and numerous of all the cave-window groups found at the head of the Clariano River. There are others located in gullies and ravines between Bocairent, Ontinyent and Alfafara. However, the Moorish Caves at Bocairent are the most famous and the ones most written about. They are made up of about fifty windows that give access to as many chambers, and there are nine other windows, which are incomplete. The windows are dispersed along three different levels but without actually forming regular “floors”. The majority of these chambers were probably originally constructed as isolated units, seeing as they all have anchoring rings for ropes, and runnels and grooves for fitted doors and window frames… however, nowadays the chambers are interconnected via gaps in the walls (that also appear to be ancient), as well as via small “chimney-flues” that give access to the different levels. One of the windows is situated at a lower level than the rest of the group – at a height of about 8 metres above the ground – and does not have an internal chamber but instead is a type of “chimney” with steps carved into it. With the aim of improving access, part of the area was dynamited, ruining this window in 1908. In recent years a metal stairway has been installed allowing much easier accessibility to the caves. However, prior to this, entry to the caves was difficult and meant stepping along a series of pedestals slotted into the rock. There are two other access routes using this method by approaching the caves from the extreme north and from the northern third of the windows. The chambers, which are nearly all rectangular and of varied sizes – on average from 2.5m x 3m to 2.5m x 4m – do not contain silos or other noteworthy features, and only a few have deposits or open storage compartments. Opposite this group there is a solitary window – the Calvary; and in the vicinity of Bocairent there are two other groups: the “Colomar” and the “En Gomar” caves. Caves Bocairent. 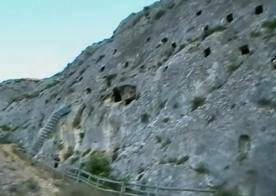 Throughout the ages there have been numerous interpretations concerning these cavities (ancient funeral chambers, granaries, a Visigoth monastery), although the caves are difficult to date due to the lack of archaeological finds, inscriptions or other data. 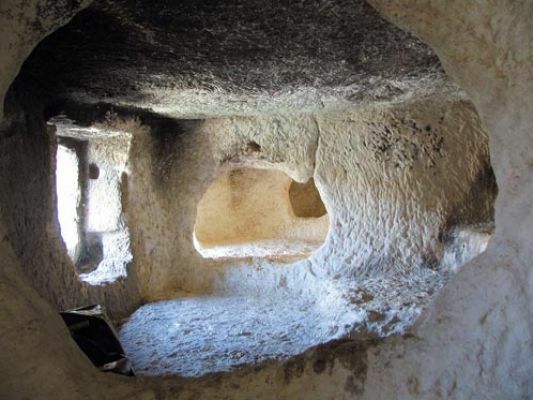 Following diverse archaeological explorations carried out by the MAOVA (The Archaeological Museum of Ontinyent and the Albaida Valley) – still incomplete – it is fairly clear that they were used as security granary-storerooms. They were most likely carved out of the rock during the Andalusí period (Hispano-Arabic), and served specific rural communities in the area, very probably of Berber origin. It seems that this type of granary model was brought over from the north of Africa (for example, the Tazaghin in the High Atlas). 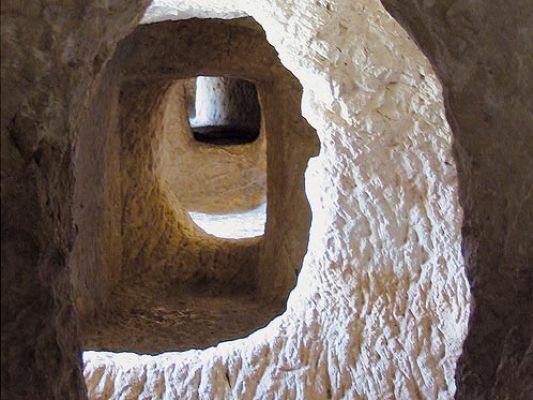 Hypothetically, they would have functioned in a similar way to the collective storage rooms of the Berber or Agadir people, at least in the case of the more numerous Moorish Caves. They would have been constructed at a precise moment in time – still to be exactly determined – probably between the X and XI centuries. Bocairent – Exploring The Artificial Moorish… by jayenwoods. Bocairent is a very laid back town where the locals take siestas in the afternoon. Most shops in the village close Saturday afternoon and all day Sunday so remember to get you’re shopping in before around 1pm Saturday. On the weekends Bocairent is a pretty lively place with the locals eating out in the main square and then partying hard till the early hours of the morning. There is a disco which is worth checking out on a Saturday night. can you explain how to find the caves, please, and what is access like. The access is good, but you need to be quite agile to get round them, you need to get into the town square, stand with the town hall behind you, (and the water font in front of you) … turn left and walk up the hill, (opposite end to the archway) past the police station on your right, (and my house for sale a little further on . 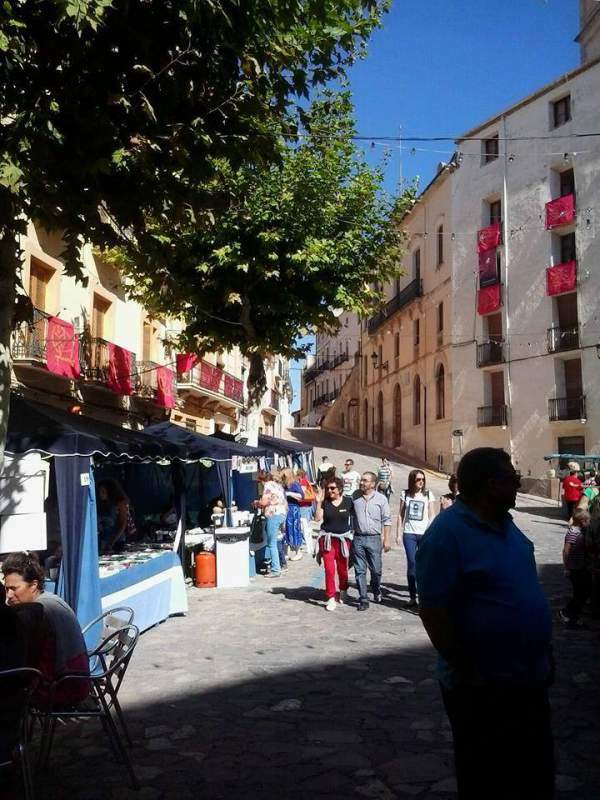 There is a nice little icecream parlour in the square and they do good food in the restaurant opposite it, ‘Chimo’ ( I lived there for 6 years, but now live in the next village) Caves Bocairent.